Trynt Kelly is one of the founding members of the KC death metal band, Marasmus, which started in 2008, opening for national acts bands such as Nile, Morbid Angel, Origin, Fleshgod Apocalypse, Hate Eternal. From there, Trynt was recruited by the legendary death metal band, Unmerciful (Topeka, KS) following the recording of their 2nd full-length album Ravenous Impulse, whom had drums recorded by none other than Mr. John Longstreth (Origin). 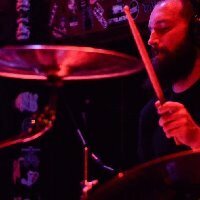 Trynt continues to tour with Unmerciful and will be recording drums for their 3rd full-length album, to be released on Willowtip Records.